The enclosure of common land across the centuries, or the privatisation of British land, is where many modern problems began. Subsistence farmers, the peasant class, were wrenched from their land by rich men’s control and might. What a great description of sustainability. Thank you, Oliver Goldsmith (1728 –1774), Irish novelist (The Vicar of Wakefield), poet, and playwright (She Stoops to Conquer). The struggle to retain our natural rights – grow food and be in nature – continues. Last weekend, I was at the launch of the Apricot Centre at Huxhams Cross Farm in Dartington, Devon (images). Thanks to the Apricot Centre CIC, the Biodynamic Land Trust and its many supporters, the land at Huxhams Cross Farm has been reclaimed and put into community ownership. “… laments the decline of rural life and the depopulation of the countryside as a result of land enclosure,” writes Diane Maybank in her introduction to She Stoops to Conquer. This poem is as relevant as ever. I have edited it for passages which shouted to me through the ages. The complete poem is here. Where humble happiness endeared each scene! For talking age and whispering lovers made! And ev’n the bare-worn common is denied. I am pleased to share with you my latest article, re-published with kind permission from Sustainable Food Trust, the global voice for sustainable food and health. I added images. In the last few decades, there has been a quiet revolution in food as more farmers have increasingly sold their produce direct to the public. By circumventing the supermarket system, farmers are strengthening local food systems, rebuilding connections between people and the source of their food. This direct sales home delivery model has long been the domain of the Community Supported Agriculture (CSA) movement. However, thanks mainly to online technology, this revolution is ratcheting up a notch with the arrival of a raft of new companies backed by city finance. HelloFresh, founded in 2011 and now active in seven countries, was valued at around £2 billion in 2015; Gousto, founded in 2012 and backed by Unilever, recently drew an additional £28.5 million from backers; and Farmdrop, founded in 2012, attracted £7 million from investors in 2017 including Skype co-founder, Niklas Zennström. The question that arises, is whether these new models enhance or weaken sustainable local food systems? On one hand, the idea of encouraging people to cook – from ‘scratch’ using recipe boxes for a fantastic array of meals, with exact ingredients and directions provided – is to be celebrated. On the other hand, could this very choice seduce the public away from supporting their local farmer? Small-scale farmers are the foundation of a sustainable food system. Organic, biodynamic and other sustainable agriculture systems regenerate soil, support wildlife and produce a variety of fresh local food which increases local and national food security. Selling direct enables farmers to keep their small-scale values – and their profits. By buying directly from a farmer, a food citizen is supporting economic and environmental sustainability. Pioneered by small-scale organic farmers in the 1980s, the CSA model of direct sales and home delivery by-passes the supermarket system and its pulverising demand for industrial uniformity. The humble veg box has been crucial in establishing a direct connection between shopper and farmer – as well as reducing plastic waste and fuel miles. The CSA reinforces this bond. Members support the farmer come rain or shine (literally) by paying up front for their share of the harvest. It is not a one-way relationship. A CSA member gets fresh local produce, knows exactly where their food comes from, and has opportunities to volunteer or socialise at the farm. The idea that well-endowed home delivery companies could threaten CSAs is nothing new, according to Maresa Bossano of CSA UK Network. “Small organic veg box schemes in the UK went through the same thing quite a few years ago when [box schemes] from Abel and Cole and Riverford first came on the scene, mainly because they offered customers more choice and better customer service; in many cases, smaller box schemes couldn’t compete and closed down. Others expanded and changed the way they operated by also providing imported fruit and giving customers the option to choose which produce, not just a set box, like some community-run schemes such as the Community Farm (pictured above). Marina O’Connell (pictured above) who grows and sells produce at 34-acre Huxhams Cross Farm, two miles down the road from big box company Riverford Organic Farmers, has also adapted their CSA offering. It could, certainly, be argued that big national schemes encourage sustainable food production. Abel & Cole, founded in 1987 and now owned by William Jackson Food Group, may be a middleman but it sources 95% of its fruit and veg direct from organic growers. Riverford Organic Farmers, also founded in 1987, has similarly created outlets for organic produce. A family business growing 30% of its produce in Devon, it works with a farmer-owned cooperative of 16 small-to-medium organic farms. From June 2018, Riverford will operate as an employee-owned business, with its founder, Guy Watson retaining only 26% of it. Technology is the driver in this current phase of online food offerings. It is, for instance, creating new ways of selling local food with initiatives such as the not-for-profit Open Food Network, an open source online food distribution system, and The Food Assembly, a cross between a buyer’s group and a farmers’ market. Let’s hope the start-ups are listening to the millennials because HelloFresh has a disturbing lack of information on its website. “Our veggie box is bursting with tasty new ingredients and adventurous recipes that will make your taste buds sing.” This slogan makes no reference to provenance or seasonality and tells you nothing about where the produce comes from or how it is produced. Perhaps the real risk to sustainable food is the lack of transparency with marketing messages which may not live up to their promise? In the online advert bidding wars, HelloFresh and Gousto are positioning themselves as alternatives to the established organic box schemes, Abel & Cole and Riverford. However, apart from featuring Yeo Valley Organic yogurt, I could see no other reference to organic produce on Gousto’s website. I contacted Gousto, Hello Fresh and Farmdrop about their sourcing policies but only Farmdrop replied. Billed as the ‘ethical grocer’, with hubs in London, Bristol and Bath, there is a lot to like about Farmdrop: its search boxes for organic and pesticide-free; its mobile app (instead of a weekly subscription) which links farmers and customers; and its stated mission to “fix the broken food system”. Farmdrop also believes in a fair price to farmers. Its policy is to pay local suppliers “at least 70% of the final retail price. The exact amount will vary depending on the producer. Milk suppliers for example usually take a higher margin of around 75%,” says a spokesperson for Farmdrop. According to its website, farmers would be lucky to receive 50% from supermarkets. According to the Soil Association Organic Market Report 2018, alternative models of shopping for organic food are expanding: online shopping sales grew by 9.7% and home delivery (i.e. box schemes and recipe boxes) grew by 9.5%. CSAs do not need to lose out, if cooperation can be encouraged: ”It would be good to see some of the platforms develop a section for CSAs, perhaps working with the CSA Network UK to help develop this,” says Ben. Although CSAs may not be able to compete on choice, they continue to flourish, with over 100 CSA farms listed on CSA Network UK and over 15 new ones in 2015-17. So says Jess Thompson, co-founder of Migrateful, where asylum seekers, refugees and migrants teach their traditional cuisines to the public. Personally, I bless migration for transforming modern British eating. Can you imagine a world without pasta, curry or houmous? Jess has spent the last two years supporting migrants and refugees in Morocco, Dunkirk refugee camp and Tower Hamlets. She points out that the word “companion” is derived from the Spanish “con pan” meaning “with bread” – a companion is someone with whom you share your bread. Above is a pic of the co-founders, Jess Thompson (left) and Jules Mazza-Coates whom I have known since she was little. Jules was brought up to believe the act of sharing a meal helps build human relations, and that preparing home-cooked, fresh food can be simple and cost-effective. After working with refugees in Calais refugee camp, Jules supported their integration in the UK. Every Wednesday at the Migrateful chef training in London, the chefs – from Syria, Iran, Lebanon, Nigeria, Eritrea, Ethiopia, Ghana, Ecuador, Cuba and Pakistan – take it in turns to teach the group how to prepare their cuisine. Majeda (above) leads a Syrian cookery class for the group. A mother of two, she arrived in the UK a few months ago. “I wish I were in Syria now, I know my country needs me and I miss my two boys and husband so much”. What is her story? Majeda was working as a children’s therapist in the capital when war broke out in Syria. Thousands of Syrians fled to Damascus after their homes were bombed by the Syrian government. Majeda organised an initiative to feed her displaced countryfolk. The Syrian government imprisoned her for four months for feeding Syrians from areas under occupation. After her release, she continued her support for the displaced Syrians. Eventually, threats from the state became too much. For the sake of her family’s safety, Majeda had to leave Syria. “I believe there is a relationship between cooking and love and that preparing a meal for the one you love, combining your skills and your feelings to create something, can convey a lot to the person. I have a real passion for cooking and I think that passion is one of the things that makes me a good wife, mum and friend”. Migrateful’s next class is a vegan Ethiopian cookery class in Brixton, London, on Monday 30 October. Migrateful comes to Bristol on Monday 6 November to teach Argentinian cooking with José (see pic below). When we break bread together, we become companions. 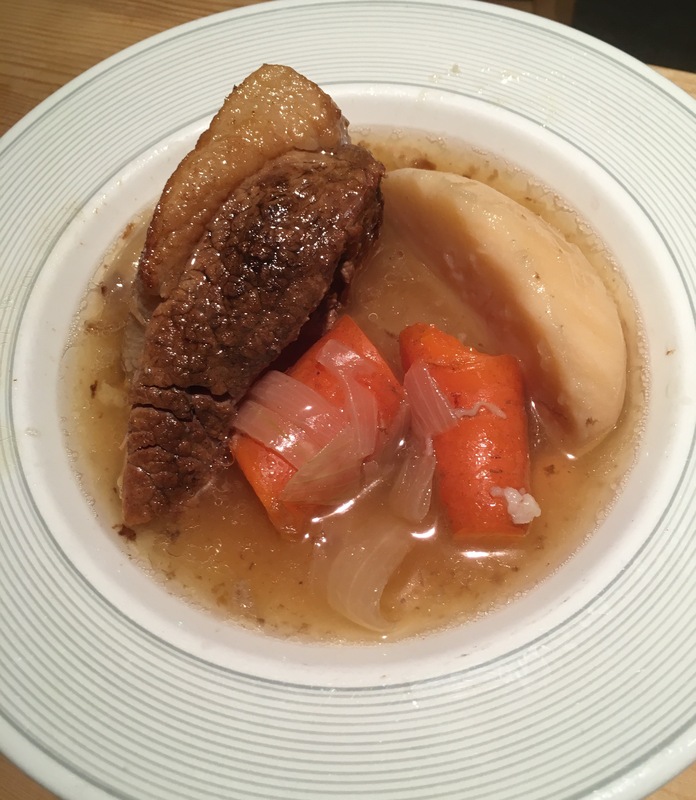 Claudia Roden’s recipe is based on one by Shmulik and his wife Carmela, of Shmulik Cohen Restaurant, which has neither changed its location or menu since it was founded in 1936 by Shmulik’s grandfather. Adjust seasoning with salt and pepper and add whole peeled garlic cloves and a peck of dried chilli. In a large pot or casserole with a tightly fitted lid, brown the meat (in its own fat or in a tablespoon of oil). Remove it, and fry onions till soft. Return the meat to the pot, add the marrow bones, potatoes, barley and beans around it, seasoning with salt and pepper. Cover with water and bring to the boil. Remove the scum with a large metal spoon, then put the lid on and leave in the lowest oven (225F, 110C, gas 1/4) overnight. Kefir cheese is a mind-blowing taste-tastic discovery. The freshest cheese I have ever tasted. And I brought it into being! I am in awe I can make cheese. And such a digestible and delicious one at that. A soft cheese, it is dreamily delicious with olive oil, chopped fresh garlic and a tiny sprinkle of salt. Or try Annie’s recipe with pureed herbs. (Thank you, I will). **Strain the grains for cheese through a muslin. My casual method: Let the grains sit a few hours in the strainer – plastic/non-metallic it has to be. ** *Oxygen in or out (anaerobic) for fermentation? 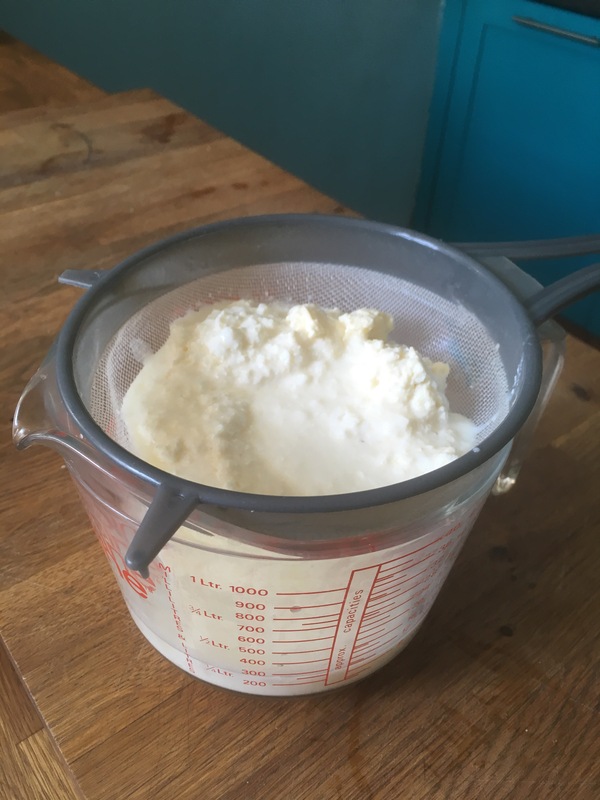 Following my previous blog on milk kefir, I had a big discussion with friends on Facebook as to which method was best. It turns out both methods get results. I sling a tea-towel over the fermenting milk. Am no longer obsessed with the perfect cover/elastic band although it was that detail that gave me confidence when I began kefir-making. *By the way, kefir grains are not actually grains. They are SCOBYs or Symbiotic Communities of Bacteria and Yeast. “Ayyyy, my scobys.” Like the Fonz. The SCOBYs, my new best friends, feed on the fresh milk, thus fermenting it, making it digestible and delicious. Check out the beneficial health effects of kefir and buy grains here too. Or ask a kefir-making friend for grains. Having generated sufficient kefir grains to eat as soft cheese feels like my reward for tending them. My mother, Fay Winkler, died on the 11 January 2017. My mother is the original real food lover, who inspires her family with a love of cooking and an ancestral knowledge about what makes real food. I have often referenced my mother on this blog. And I am not going to stop now. For instance, we have inherited a huge file of recipes including traditional Jewish dishes made by my grandmother. I can’t believe I have not yet posted about Fay’s chicken soup. In my 2010 blog on Fay’s fish soup made with wild sea bass, she talks about her fishmonger, Pat, in Tachbrook Street market, London: “If he packs up, I’ll pack up” she says. Fay and Pat the fishmonger go back a long way. Here they are in the 1980s. Fay believes, “good food begins with good ingredients”. “You can’t make a silk purse out of a sow’s ear,” she says. You have to buy the best – be it organic, free-range, fresh, seasonal, local and/or artisan – to make a good meal, she says. If the ingredients are good, no need for complicated recipes (as her mother said before her). Ingredients, ingredients, ingredients. The only three words you need to know when it comes to cooking.